The winter Solstice is a day that I look forward to each year because it is the day that the days start to get longer, a promise that spring will come. This Pattern is on the cover of A Morbid Taste For Bones by Ellis Peters…I broke down to a line of each of 4 colours that twist and twirl under and over each other, I did the lines with stem stitch and just had to watch the unders and overs where the lines cross. 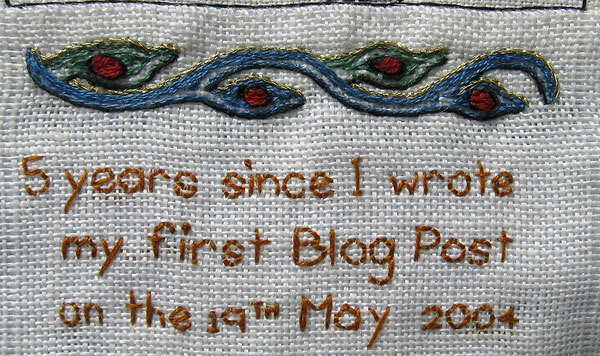 The next few things on my list are words and I thought that they needed something between them, I was thinking along the lines of a line with a couple of loops, I didn’t want anything that was going to distract me from getting on with the catching up but while thinking about what I could do I saw the cover of a Brother Cadfael novel…The Brother Cadfael novels by Ellis Peters all have a line of medieval design on them, some of which looked as if they could be stitched…yes they have distracted me a bit and meant athe at the catching up has taken longer but I liked the idea of including them because my sister and I were reading the novels at the time of the events I am currently stitching. I don’t often repeat an embellishment on a block but sometimes repeating an embellishment is what brings everything together…I had left the top seam on my block until we had all the blocks together so that we could see what was needed…I had done the flowers below on my block and a couple of the other girls had done similar silk ribbon flowers on there blocks and when it was time to decide it just seemed to feel right to repeat the silk ribbon flowers at the top. To the right is a Shisha which I surrounded with beads and then added Bead dangles to it. 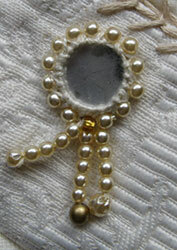 Below is a rushed ribbon stitched on with Beads and sewing charms. 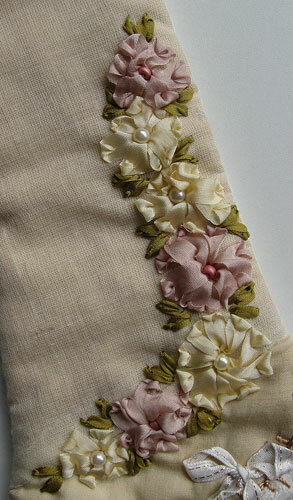 The seam is Buttonhole Stitch done with different length arms and flipped from side to side in groups of 3, The thread is a size 3 pearl twist Rayon. 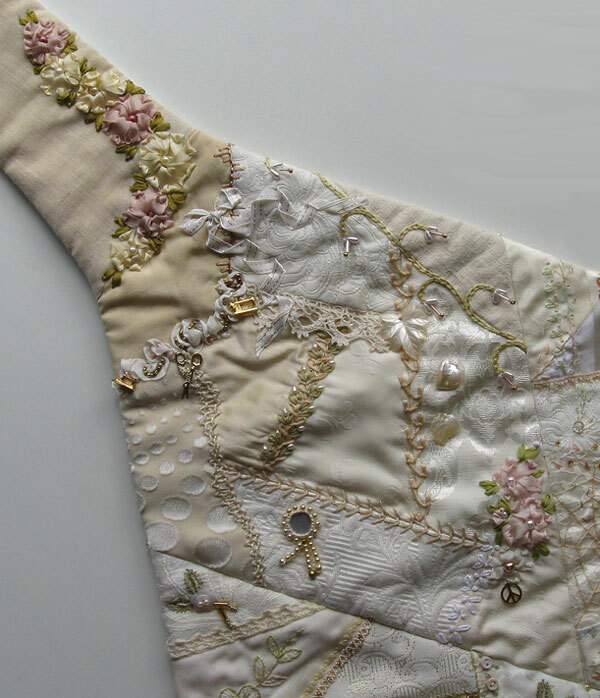 I chose simple stitch for this seam because I wanted it to be background and most of it is covered by the white bow which is the focus of the seam. 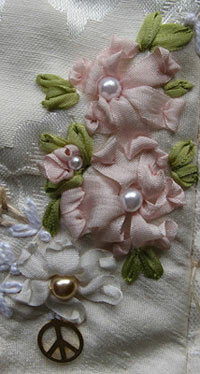 The seam to the right is a vine done using Chain Stitch with bead flowers. 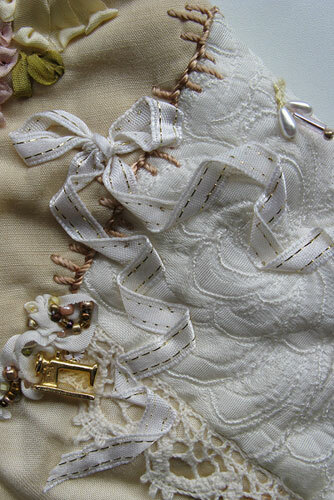 The seam above is Twisted Chain Stitch done with a cream stranded cotton thread and Detached Chain Stitch done with green stranded cotton and trimmed with Pearl Beads. The seam on the right is Up and Down Buttonhole Stitch done with stranded embroidery thread…I have also scattered leaf beads on top of this seam. 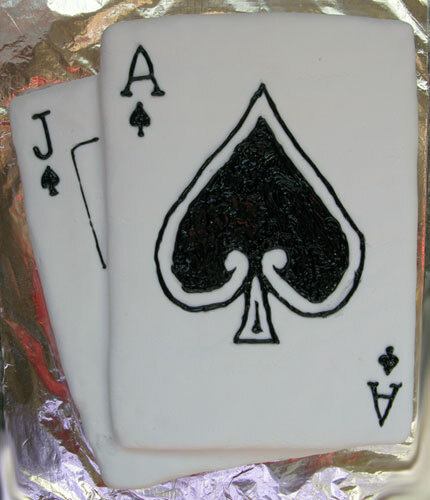 We shaped the cake so that the Jack was lower than the ace and we used royal icing to get a smooth white surface and a tube of black writing icing to add the detail…we had a few problems with the royal Icing but it all came together when we added the black details.